Nathan Cleverly's WBO light-heavyweight title shot against champion Juergen Braehmer will be staged at London's O2 Arena on Saturday, 21 May. Promoter Frank Warren confirmed the delayed show on Thursday as the Welshman was due to fight German Braehmer at Wembley Arena on 2 April. He was forced to fight 24-year-old Cleverly or be stripped of his belt. The showdown will take place the same night as the Bernard Hopkins v Jean Pascal rematch in Canada. That clash in Quebec will decide who is the top-ranked fighter at 175lb. Braehmer pulled out of a title defence against WBA title holder Beibut Shumenov in January because of illness. But he will fight Cleverly in London and their bout will top the bill with James DeGale's grudge match against George Groves on the undercard. "I always thought that I would get my shot at Braehmer," Cleverly has said. "There was talk that he might be stripped or would vacate the title, but I never wanted that to happen. "He's the champion and the only way I would consider myself a true champion is if I took the belt from him, rather than picking up the vacant title." 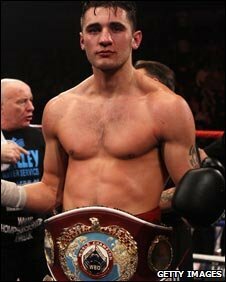 Cleverly picked up the WBO interim light-heavyweight title at Liverpool's Echo Arena in December 2010, with a unanimous points win over awkward Frenchman Nadjib Mohammedi. The maths graduate is unbeaten in 21 fights and could have been upgraded if Braehmer had been jailed after receiving a 16-month sentence for assault and insulting behaviour. But the 32-year-old's appeal - which began on 13 December 2010 - is likely to be a drawn-out process, meaning Braehmer will continue to box despite his court battle. Cleverly would become the 11th Welsh world boxing champion if he does secure the WBO belt. And should he be crowned world champion, he would become the second Welshman after lightweight legend Freddie Welsh to win British, Commonwealth, European and world belts.